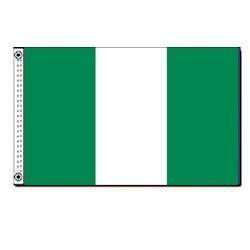 The Nigerian flag was designed in 1959 and first hoisted officially in 1960. It is an adaptation of Michael Taiwo Akinkunmi’s winning entry into a competition. The original design featured a sun, which was removed. The two green stripes on this flag represents the forests and natural wealth of Nigeria; the white stripe stands for peace.